“Oh goody!” was my reaction on receiving this book. I confess to being addicted to Gettysburg and always enjoy another Gettysburg book. 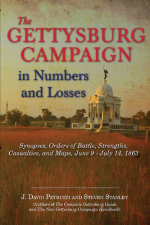 However, a book by J. David Petruzzi and Steven Stanley is not “another Gettysburg book”. Their unique talents and vision result in Gettysburg books that tell the story in a fresh way. Their approach coupled with Savas Beatie’s dedication to publishing excellence produces a book that appeals to the eyes and the mind. We tend to look at the war’s battles as linked but discreet events. This tendency can exclude the smaller battles producing a First Bull Run, The 7 Days, Second Bull Run, Antietam, Chancellorsville, Gettysburg view of the war in the east. While this makes for good reading and great battlefield walks, it misses most of the war. This book looks at the most famous Civil War battle as an event in a chain of events. This shows us the “give & take” of campaigning and how small events create big events. We start with the battle of Brandy Station on June 9 proceeding through a series of encounters ending with the skirmish at Falling Waters on July 14. The format is a narration of the event, the forces involved, casualties and an assessment of the impact on the campaign. This is a real-time assessment looking at the event as it they saw it without the history books and shows how the armies took the historical road. On the page with each event is a time line that places it within the overall campaign. This simple device fixes the reader within the campaign and never allows a “where are we now?”. The presentation of casualties rolls up from regiment to brigade to division to army. A separate bar graph shows effective strength and casualties by branch of service. Photographs of major participants grace most pages putting a very human face on the words and tables. Steven A. Stanley did a magnificent job on the maps. They are detailed but clear. He manages to keep multiple unit positions on one map without confusing things. Many of these maps are small scale, one thousand feet to the inch, proving real details. J. David Petruzzi is easy to read conveying information in a concise way. He manages to make us “see” the action without dramatics. He understands and is passionate about Gettysburg and wants the reader to enjoy it as much as he does. Savas Beatie continues the tradition of high quality books that appeal to the eye as much as the mind. This book will make be a well-received gift after you have a copy in the library. Expect to see many people with this book on the Gettysburg Campaign trail. It will make an invaluable guidebook. Additionally this is an enjoyable history that you will want to sit and read.